JEDDAH: The hospitality of King Salman highlights his interest in Islam, scholars, as well as the security and stability of Islamic countries, Minister of Islamic Affairs, Dawah and Guidance Dr. Abdullatif bin Abdul Aziz Al-Asheikh, said during a speech to senior guests of the Hajj and Umrah 2018 program. He said that the hosting program is a service for scholars, preachers, sheikhs and influential people in the Islamic world. There is no doubt that the Islamic world has many prominent elites that have great influence on education and fatwa; this is why the program stresses conveying the Saudi message of serving the Muslim world to these elites, he said. 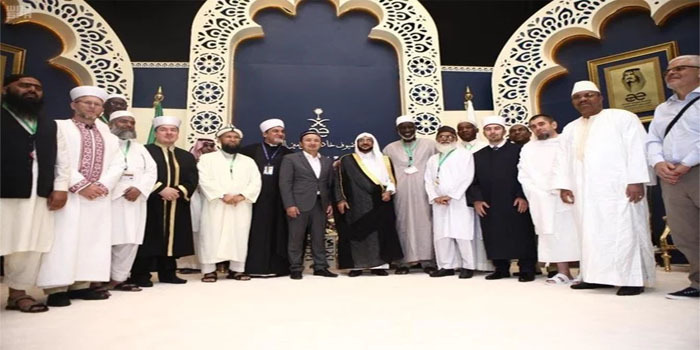 Al-Asheikh highlighted the importance of the role played by scholars to explain the message of Islam and the moderate approach that fights radicalism and extremism. “You are the best model in your country. You carry the message of Islam and spread the truth there, explaining many crucial concepts,” he said. He said that King Salman and the crown prince are continuously supervising work to develop the holy sites and organize the Hajj and Umrah journey for the best of the pilgrims. The minister listened to the speeches of senior guests who noted the continuous efforts of the Kingdom under the leadership the king and the crown prince, serving Islam and Muslims and defending their causes. The senior guests thanked the Kingdom for this program that reflects the leadership’s attention to scholars and influential figures in countries around the world. Al-Asheikh has started his visit to the guests’ residence in Makkah, inspecting the hotel facilities, and making sure all committees are ready. During his visit to the medical committee, he checked on the guests and emphasized the need to provide medical care around the clock and ensure that there is nothing to impede Hajj rituals.